‘Trup’ in Sanskrut means ‘to satisfy’. The word ‘Tarpan’ has originated from the root ‘trup’. Offering water to Deities, Sages, pitars and human beings and satisfying them through it, is called Tarpan. The objective of performing Tarpan is that Deities, pitars etc. whose names are pronounced while performing Tarpan, should ensure our welfare. Brahmayadnyanga (performed during sacrificial fires), snananga (performed every day after bathing), shraddhanga (performed during shraddha) are the various Tarpans that are a part of various rites and should be performed during the respective occasions. Bodhayan has mentioned that Tarpan should be performed on the bank of a river. While performing Tarpan, either stand in the river water so that the water touches the navel region or perform it on the banks of a river. Perform Tarpan by facing east for Deities and Sages, and facing south for the pitars. Darbha is necessary for performing Tarpan. Tarpan for Deities is performed from the tip of the darbha, Tarpan for Sages by folding the darbha in the middle, and for the pitars from the root and tip of two darbhas. Perform Tarpan for Deities using the Devtirtha, meaning, the finger tips, that for Sages using the base of the index finger and the little finger and to the pitars through the mid-portion of the forefinger and the thumb of the right hand. Offer Tarpan of one anjali (See paragraph below) to the Deities, two anjalis for the Sages and three anjalis for the pitars. In case of matrutrayi (Mother, grandmother and great-grandmother) offer three anjalis and for other ladies offer Tarpan of one anjali. Water offered for the sake of pitars is termed as PitruTarpan. A jivapitruk is forbidden from performing PitruTarpan. 2 B. Why should it be performed ? Apart from expectation of the pinḍa and offering of food to Brahmans by their descendants, the pitars also expect offering of water from them. When Tarpan is performed, it is not just that the pitars get satisfied and leave, but they also bestow long life, Tej, Brahmavarchasva (Knowledge of Brahman), wealth, success and Annadya (Ability to digest food) on the performer of Tarpan and make him contented. 2 D. When should it be performed ? Tarpan for Deities, Sages and pitars should be performed regularly (everyday). Tarpan should be performed every day in the early morning after a bath. 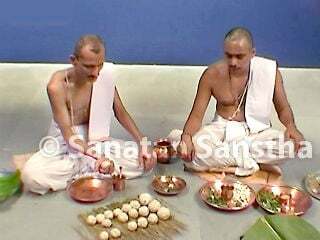 If it is not possible to perform shraddha every day for the pitars, then at least Tarpan should be performed. 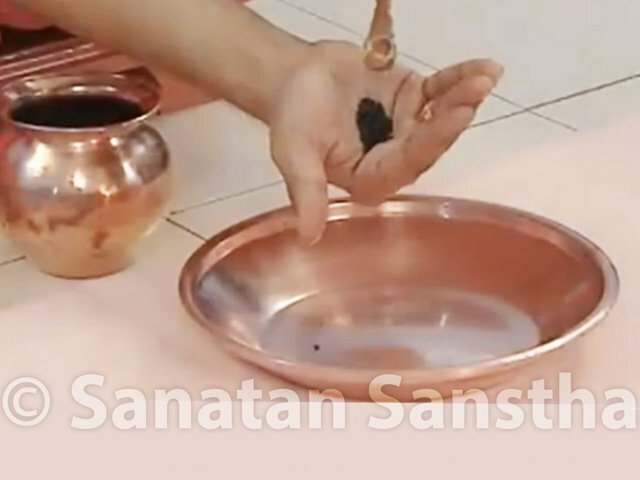 PitruTarpan should be performed on the day following the day on which Parvana shraddha has been performed. Sesame seeds are available in two varieties – black and white. Black sesame seeds should be used for shraddha. If sesame seeds are not available, then gold or silver should be used. Tarpan performed for the pitars using tilodak (Water with sesame seeds) is termed as tilaTarpan. 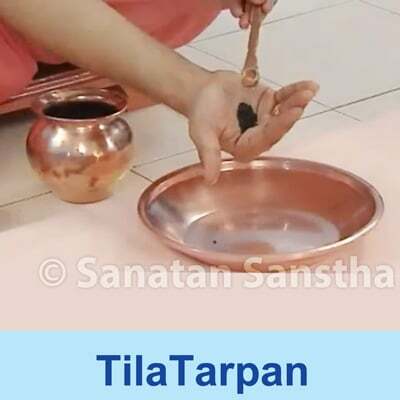 TilaTarpan should be performed to the same number of pitars for whom the shraddha has been performed as part of the shraddha. TilaTarpan is performed before the Darsha shraddha and on the day after the annual shraddha. 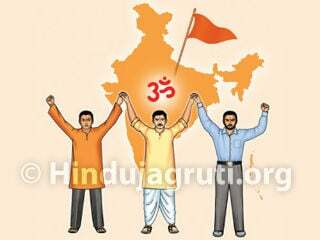 In case of other shraddhas, tilaTarpan is performed immediately after the shraddha rites. 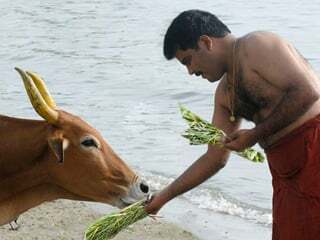 TilaTarpan is not performed during Nandi shraddha, Sapinḍi shraddha etc. 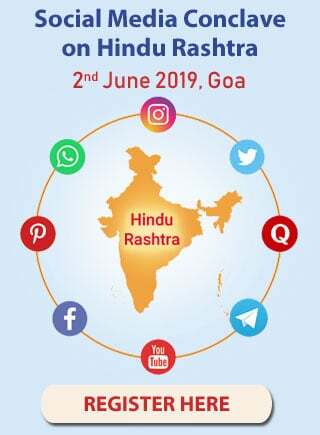 On the day of shraddha, sesame seeds should be sprinkled all over the house, tilodak should be given to the invitee-Brahmans and the sesame seeds should be donated. Radiance / Absolute Fire Principle.